And it starts here: on Earth, at mission command, also known as 'your computer'. In this book, you'll learn how to build your own graphical adventure game, with a map to explore, objects to interact with, and tricky logic puzzles. You'll discover how to use Python to build the Escape game. You'll learn how to customize it, so you can add your own graphics and puzzles, and even use the game engine to build an entirely different game. 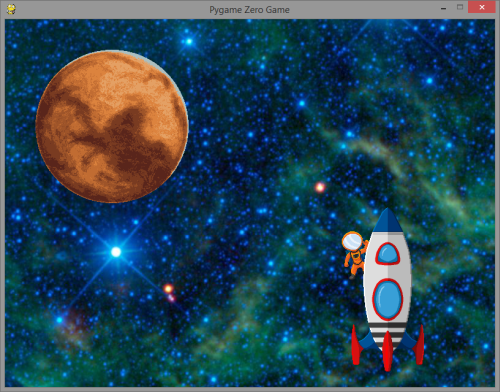 For the graphical elements, you'll use Pygame Zero. The game runs on a Windows PC or a Raspberry Pi, and uses free software. The game is supported by a pack of downloadable sounds and graphics to use in building the game. Mission Python is out now! For updates, follow me on Twitter. 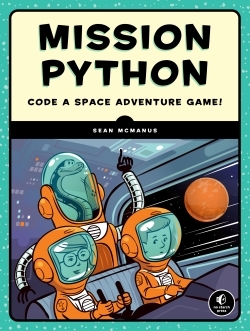 Take a look at Mission Python with this free PDF sampler. It includes the Introduction which shows you how to install the required software and provides instructions for playing the space adventure game, called Escape. It also includes Chapter 1, so you can get your first taste of programming using Python and Pygame Zero, creating a simple spacewalk simulator. You can download all the code, graphics and sound effects for Mission Python here. Use this file in combination with the Mission Python sample PDF above if you'd like to try playing the game right now! I'll be adding more resources here to help you to get the best from this book and the game. Follow me on Twitter for updates! 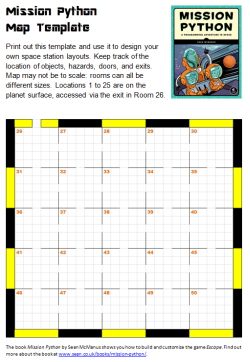 Mission Python: Download the space station map - reveals the room design for each room in the game, and helps you play or customise the game. Mission Python is out now! The book went through extensive quality control, but I've been alerted to a couple of errors that have slipped in despite our best efforts. I'm maintaining a blog post for errata here. Take a look at the new edition of Raspberry Pi For Dummies, out now. It includes two chapters introducing programming in Python, and using Pygame Zero.